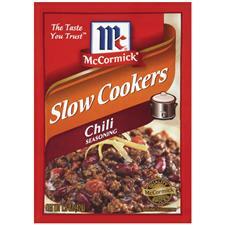 I swear by McCormick's slow cooker chili seasoning packet! We had this for dinner Tuesday night, and it was as easy as 1, 2, 3, and as delicious as ever! With only 15 calories, 0 grams of fat, and 2 carbs per serving (before my add-ons), it's not the worse meal for you, either.